By popular demand and a growing positive response, we are taking the underground, above ground and hosting a very special night on the MAIN FLOOR! Bringing you new gritty basslines from across the globe. German Industrial Bass, Dark Electro and Techno, French EBSM to name a few. The list goes on and on. You'll hear sounds from artists like Schwefelgelb, Phase Fatale, Rendered, DSX, Leibknecht, Blush Response, Gesaffelstein, Noizinski, Hipp0, Owl Vision, REZZ, Moris Blak, Animal, Formshift, I Hate Models, Fractions, Corvad, Into the Pale Abyss, Unholy, Swarm, Toska, Razorback Hollow, Randolph and Mortimer, Horskh, Cogex, Codex Empire, Acid Vatican, and so on and so forth. We are just scratching the surface with new and striking contemporary artists and we're always searching to discover new gems to share with the dancefloor. So if you're looking for the mainstream hits that we all know and love then this isn't the place for you. It's best you stay home where it's safe. 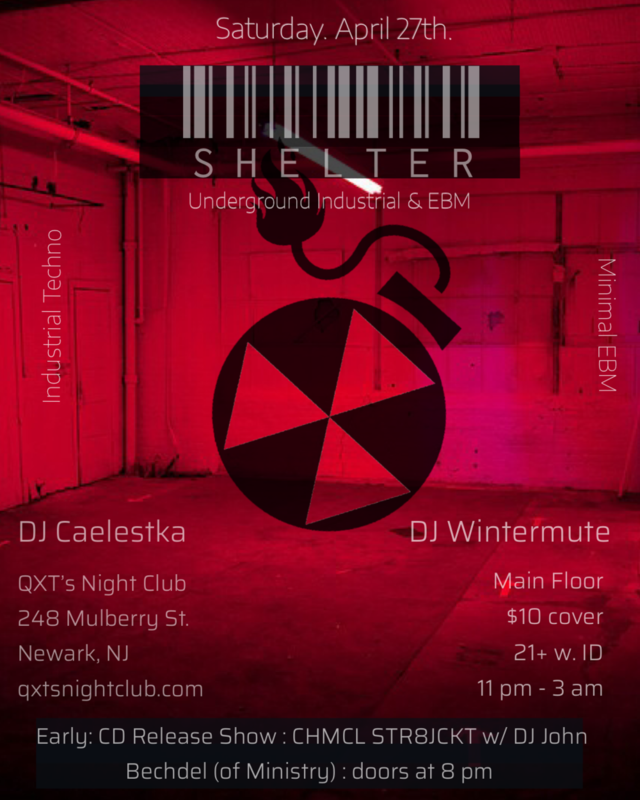 But if you want edgy modern traxxxs then go underground and find Shelter @ Qxts on April 27th. A full night of events not to be missed!